This weekend our hearts were filled. 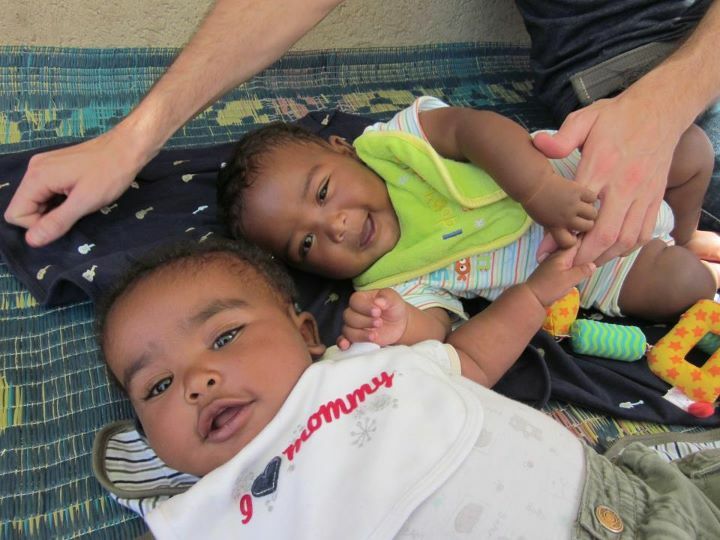 Friday was “coming home day” for our adopted nephews, Kingston and Kyrie, from Ethiopia. And I am excited to share photos of them FINALLY with you. These are compliments of their proud momma, my sister-in-law, MacKenzie. Kyrie is up front and Kingston is in the back. This photo was taken in Ethiopia just weeks before they came home. They are fraternal twins who are about seven months old. Needless to say, Cort and I are very proud uncle and auntie. And Eddie loves to look at pictures of his new cousins (“babies cuz-ins” as he calls them). I promise to post, tweet, and facebook links when Kenz gets a chance to up date her blog. If you haven’t read their amazing journey, now is a good time. Your heart will be filled too. Remember that part in A Christmas Carol where Scrooge is looking at a former version of himself? Yeah that. Oh my beautiful sister has it. It suddenly hit me in the face that it does not matter if you adopt or push that baby out of your body, as a new mom you are just not ready for the hardness…for the reality check of having a baby full time. And MacKenzie and David have TWO. There were other family members there, but I wanted to just grab her and wrap my arms around her and tell her it will be Ok.
She was sleep-deprived from new babies and over 24 hours of traveling. She hadn’t looked in a mirror all day (although I thought she looked stunning. Motherhood is gorgeous on her!). She jumped each time one of the boys peeped. She refused food and then thought she should have some only to just sort of pay attention to it. She burst into tears easily. My heart just leaped from my chest into hers. I wanted to grab her and tell her how it would be fine. But I know that wouldn’t help. So many people told me it would be fine and I STILL had to figure it out on my own. What I hope for her is some sort of semblance of a schedule. For an ease in her bond with her new boys. For that click when you get their little signals and you know what to do about it. For a comfort that she is being loved and prayed for. For the knowledge that she can lean on me…hard…when things get rough. Because they will. For the assurance that she can talk about the difficult stuff and not keep it bottled up so it doesn’t turn into post adoption depression syndrome (because I wouldn’t wish depression on my worst enemy, let alone my loved ones). The New Mom Self is going to stick around awhile. And that is Ok.
You only get to do “New Mom” once. And other than the tough moments, being a New Mom can be so sweet. I can’t wait for her to have those “Oh my word…they are MINE” moments. A new world just spread itself before MacKenzie and Dave. A rugged, unexplored, beautiful world. We can’t wait to celebrate this journey with them! LOTS of love to your beautiful, growing extended family. Those two are such sweethearts!! Hugs to your SIL, in hopes that random love from strangers helps get her through the hardest parts so she can enjoy the best parts! Oh yay!!! I’ve been reading your SIL’s blog now and then waiting to see when they’d arrive. I’m so very happy for them and you and your whole family. What absolutely beautiful little boys. She will definitely have her hands full, but also she’ll love it. I just went over and read her last few posts. She is adorable, and I love her blog already 🙂 Can’t wait to have more time to keep reading. Congratulations on your adorable new nephews! They are so adorable I can’t stand it!!! My sister just had twin girls. They’re five months old now and it’s oh so hard with two. Motherhood looks gorgeous on her too. Your niece and nephew are beautiful. My nieces are a mix of Indian/Caucasian. They have beautiful skin. Yes, new mom-ness. Hard and wonderful, exhausting and fabulous, gut-wrenching and enlightening. I’m glad Mackenzie has a sister-in-law who gets it. I’m so glad those babies are home! So very happy for them, and for ALL of you!! It certainly doesn’t matter how you become a mom, it’s all the same. You are an amazing sister and those boys are so lucky to have you as their auntie. Congratulations to you all. It doesn’t matter if you birthed them. Giving them all of your heart is what makes you a mom. Look how precious! They have captivating eyes! So happy for them! They must be feeling ultra blessed and ultra overwhelmed all at the same time. So glad they got to have them home before Christmas. Oh my word. They are SO gorgeous and they look so happy. A huge congrats to all of you! Gorgeous!! So happy they are home. they are so cute, congratulations auntie!! This post? Also so beautiful. It’s so true that it’s a new world, and she will figure it out a little at a time, just like all of us did. What an absolute blessing for your family. Eddie got babies cuz-ins for Christmas! Those are two gorgeous babies! Congratulations to your sister. What a lucky, beautiful family you have! SO precious! Your SIL is lucky to have someone like you to be there for her in the early new mom stage! The boys are sooo beautiful. Congratulations to your sister-in-law and your brother, and of course the rest of your family to welcome these new members. Sounds like the little guys are already showered with love! They are so adorable! I’m so happy for your sister and your family! So very exciting!! I’m happy for all of you! I will say that adoption was the single most exciting & rewarding & frustrating & wonderful adventure that I’ve ever gone down the road for.